This book was truly outstanding, from the characters and content all the way through to the writing. This is historical fiction, action adventure and an epic love story rolled into one. At first, it took me a long time to get into the story; at 592 pages, it’s a fairly epic read! The first chapter is Russia in 1917, showing how Valentina and Lydia came to be in China in the first place. This was an interesting first chapter that gave a small taster of the violence, action and fast paced plot that was about to come. However, the next couple of chapters didn’t intrigue me and it was a very slow start where setting up the main characters took precedence. There are a few characters in this book who have their own voice and who’s point of view we get to hear about. Lydia of course is the main one. At sixteen, Lydia is young, fiery and fearless. Reading about her tough life in the International Settlement was heart wrenching, and her forbidden relationship with the young Chinese Communist Chang was touching. There were also chapters where Chang’s point of view was shown. Chang is an exciting character, one who knows how to defend and look after himself and a man who has strong political views. One of the most interesting parts of this book was how the relationship between Chang and Lydia develops as from the beginning he is both attracted and repulsed by her. He is amazed by her strength of character and beauty, but this is the also what repulses him; he has been brought up knowing that these “fanqui” (foreign devil) were enemies of the Chinese, their very ways disgust him, from the way Lydia tries to shake his hand (contact like this is not done in China) to the way she asks direct and personal questions. Likewise, Lydia is at first wary of Chang, believing that he is just a petty thief but soon she is willing to risk her life to save his. Aside from Lydia and Chang, Furnivall has created some really colourful and interesting secondary characters which help shape the overall story. There is Theo Willoughby, the school headmasters who has a girlfriend who is the rich, powerful and very dangerous Chinese businessman. Theo’s role in the story at first seems quite insignificant, that is until an English businessman threatens to shut down his school and he is forced into doing the Opium run. The rest then gets tied in nicely, and there are plenty of threads that will keep any reader amused throughout! So far, I would imagine most people reading this would see it as quite a romantic book. Although this is true, Lydia and Chang’s romance involves so much more that would please most readers. This book has everything from a beautiful and vivid Chinese back drop, to political rows to lots of action and plenty of violence. In fact, that would be my only criticism of this book. Today I was racing through the last of the chapters, desperate to know what would become of Chang and Lydia, eating my sandwiches at lunch, only to read a rather gruesome torture paragraph or two. The images depicted in this story aren’t often so gory, but the way in which it is written evokes some strong emotions! This book really has everything you could want from a story and provided me with a lovely bit of escapism for a while – despite the length of this book, I raced through the last half it was so action- packed. This book has bags of adventure and action, plenty of war-torn romance and sadness and a glimmers of happiness throughout. I really fell in love with this story, and I adored the characters within. I found reading about the Chinese culture fascinating and the violence and death included shocking but compelling reading. Imagine my happiness to find that there is follow-ups to Lydia’s story, the book ends with a satisfactory conclusion, but it also left me wanting more. The next instalment is “The Concubines Secret” , I cannot wait to get my hands on it! 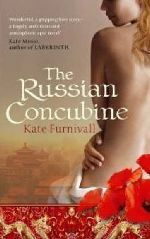 No Comments on "The Russian Concubine"